Sponsors: Famous Dave’s BBQ, Moon River Grill, Stone Hill Winery, Mount Pleasant Winery, Starlite Theatre, The Rankin Brothers and Sam’s Club has donated flowers. VETERANS… Have questions about your VA Medical Benefits & Ratings? Have questions about your VA Medical Benefits & Ratings? A DAV State Service Officer will be present to answer questions. Nashville/Branson, MO – Kirkland’s, the national specialty retailer of home decor and gifts for value-minded shoppers, will hold the grand opening of its newly-remodeled store at Branson Landing lifestyle center October 30 – November 1st, 2009. The store is 3,000 square feet larger than it was before the renovation. Kirkland’s has been expanding its store at the lifestyle center for the past several months into the adjoining space where S&K Famous Brands, Inc. was located. Other retailers near the expanded Kirkland’s store include Auntie Anne’s and Never a Dull Moment. Kirkland’s has five other stores in Missouri, including a store at Battlefield Mall in Springfield. The store in Branson already is among the top performing stores in the company. The decision to expand at Branson Landing is based on extensive research that looks at growth of an area, consumer demographics, type of shopping center, neighboring retailers and easy access. Branson Landing (bransonlanding.com) is a lifestyle shopping center with more than 90 retailers, restaurants and shopping-related services, anchored by Bass Pro Shops and Belk Department Store. Interior Designer J.L. Hill to Lead Free Home Decorating Personal Consultations with Ideas for Fall Tabletop Design on October 30 – November 1, 2009. As Thanksgiving approaches, Kirkland’s will hold its grand opening celebration with great home decor gift ideas for the holiday season. The weekend event will feature giveaways and many sale items, as well as free interior decorating consultations Saturday and Sunday by area interior designer J.L. Hill. He’ll showcase fall tabletop centerpieces with candles, greenery and leaf motifs. He’ll also be available to discuss other decor ideas to make your home more beautiful. Kirkland’s provides a broad selection of well-priced, high-value home furnishings to suit a variety of tastes, including framed art, mirrors, wall decor, candles, lamps, decorative accessories, accent furniture, textiles, garden accessories and artificial floral products. Kirkland’s Inc. was founded in 1996 and is a specialty retailer of home decor in the United States. Although originally focused in the Southeast, the Company has grown beyond that region and currently operates 295 stores in 32 states. The Company’s stores present a broad selection of distinctive merchandise, including framed art, mirrors, candles, lamps, picture frames, accent rugs, garden accessories and artificial floral products. The Company’s stores also offer an extensive assortment of gifts, as well as seasonal merchandise. More information can be found at www.kirklands.com and mykirklands.com. Our seniors deserve our support for the under funded Meals on Wheels Program that feeds and helps so many in our community. Outdoor enthusiasts, listen up! The Branson Veterans Task Force added a new event for you this year. The Ozark Shooters Sports Complex, 759 US Hwy 65 (11 miles north of Branson) will host a Sporting Clays, Trap Shoot, Wobble Trap Shoot event (your choice) from 9:00am to 12:00 noon on Sunday, November 8. Prices as follows: 50 sporting clays, $18; 25 trap or wobble trap, $5.00; gun rental, $10. Bring your own shotgun if you prefer. Cabela’s has donated great prizes for this event. Please make reservations by calling 417.443.3093. Lunch will be available. From the Opening Show at 2:00pm on Thursday, November 5, at the Mansion Theatre and the Showboat Branson Belle Salute to the Troops that evening, through the parade at 11:00am and closing ceremonies at 1:00pm on Wednesday, November 11, the week offers fun, entertainment, fellowship and educational opportunities for everyone. Check out the complete list of activities during Veterans Week at www.bransonveterans.com. The Branson Veterans Task Force honors veterans every day of the year. For more information about Veterans Week and other veteran-related events, contact the Branson Veterans Task Force at 1-417.337.8387 (417.337.VETS) or visit www.bransonveterans.com. Veterans Village and the famous free lunches for veterans have a new home! From November 6-10, from 9:00-4:00 the Cobblestone Inn, Suites & Conference Center hosts the Veterans Registry, Veterans Village and lunch (from 11:30-1:00). Lunch is free for veterans; $4 donation for others. The Cobblestone Inn is located at 276 Tanger Blvd, between Peppercorn Restaurant on Hwy 76 and Tanger Mall. There’s a back entrance from the Mall entrance – accessible from Gretna Road (the blue route) at either Wildwood Drive or Forsyth Ave.
Plan to register, get last-minute information about activities and veteran discounts, check out all the items and information that vendors have to offer, meet old friends, and enjoy lunch. Vendors, authors, and veteran organizations welcome the opportunity to meet veterans and their families. Branson, Mo. – Oct. 20, 2009 – Today, Walmart, CoxHealth and Skaggs Regional Medical Center announced a new collaboration – “The Clinic at Walmart” operated by CoxHealth in partnership with Skaggs Regional Medical Center. This new convenient care clinic will be located in the Branson Walmart supercenter at 1101 Branson Hills Parkway and will open Monday, Nov. 2. The clinic will offer the same fast, affordable access to basic health care services available at Springfield-area locations, and will be the first location in Branson. This is CoxHealth’s fifth in-store clinic in an area Walmart supercenter. This clinic will be operated as a joint venture between CoxHealth and Skaggs. CoxHealth will oversee day-to-day operations of the clinic, while nurse practitioners and collaborating physicians will be provided by both health systems. The clinics serve as an alternative for people at least 18 months old who are sick enough to need care, but aren’t sick enough to need the level of care available in an emergency department or urgent care clinic. The clinics are also an affordable option for patients who might otherwise postpone or avoid care because they lack insurance, have concerns about the cost, or are away from home and in need of basic medical services. The clinics offer upfront pricing and prompt access to acute and preventive care for common health ailments treatable without urgent or emergency care, including sore throats, sinus infections, upper respiratory infections, earaches, bladder infections, insect bites and stings, cholesterol screening, blood sugar testing, vaccinations, drug screening and routine physicals. Clinics offer walk-in service seven days a week and evening hours. Walmart has 44 in-store clinics in 12 states. For further information about “The Clinic at Walmart”, please visit www.walmart.com/clinics. For more information about CoxHealth, please visit www.coxhealth.com. For more information about Skaggs Regional Medical Center, please visit www.skaggs.net. CoxHealth is accredited by The Joint Commission and distinguished as one of the nation’s Top 100 Integrated Healthcare Systems (2006-2009). Established in 1906 and based in Springfield, Mo., CoxHealth serves more than 900,000 people in a 25-county service area in southwest Missouri and northwest Arkansas. Our services include three hospitals and more than 50 physician clinics in 20 communities, Oxford HealthCare (a home health agency), Home Parenteral Services (home infusion therapy), CoxHealth Foundation, Cox College, Cox Family Medicine Residency and much more. Skaggs Regional Medical Center is accredited by The Joint Commission. Skaggs ranks among the top 5% of all hospitals in the nation and has achieved the HealthGrades™ Distinguished Hospital Award for Clinical Excellence® (2006-2009). Skaggs ranks among the top 25 “Most Wired Small and Rural Hospitals” and in the top 25 “Most Wireless Hospitals” in the nation. Our services include our Branson hospital, more than 20 satellite clinics in Taney and Stone Counties, Skaggs Professional Home Care, Skaggs Professional Hospice, Branson Heart Center, Skaggs Cancer Center, Skaggs Foundation and much more. Every week, millions of customers visit Walmart stores, Neighborhood Markets, and Sam’s Club locations across America or log on to its online store at www.walmart.com. The company and its Foundation are committed to a philosophy of giving back locally. Walmart (NYSE: WMT) is proud to support the causes that are important to customers and associates right in their own neighborhoods, and last year gave more than $378 million to local communities in the United States. More information about Walmart can be found by visiting www.walmartstores.com. This year the Branson Veterans Task Force introduces four new mini reunions during Veterans Week, November 5 – 11. The Korean War Reunion has long been a favorite event for Korean War veterans. The WWII Reunion will be held at the Keeter Center at the College of the Ozarks from 2:00-5:00pm on Friday, November 6. All WWII veterans and all interested in WWII history are invited to attend. Earlier this year, the College of the Ozarks partnered with The Greatest Generations Foundation to send 20 students with 10 veterans to the 65th Anniversary of the Normandy Invasion. Tim Davis, founder of The Greatest Generations Foundation, and several of the veterans and students involved will discuss the trip during the reunion presentation. A screening of the Normandy trip documentary will highlight the event. Authors of WWII-related stories will sign copies of their books. The College will open a Gallery exhibit of photographs from the trip and WWII artifacts. The Special Forces A Team will host a static display of ODA Equipment on site. ODA will brief on missions, training and equipment. All activities are open to the public. To help with planning, please RSVP to the Branson Veterans Task Force at 417.337.8387. Persian Gulf War Veterans Reunion, 9:00-12:00 on Saturday, November 7, at the Tri Lakes Center, 2527 State Hwy 248. The event hosts, the Vietnam Veterans of America Chapter 913, invite all veterans of the Desert Wars to a free breakfast. The public is invited to meet these veterans. Please RSVP by calling 417.337.8387. The Vietnam Veterans Reunion will be held from 2:00-5:00pm on Monday, November 9, at Charlie’s Steaks, Ribs & Ale. Charlie’s, Gatherings Plus and the Branson Convention Visitors Bureau host the event and invite all Vietnam veterans to attend. Please RSVP at 417.337.8387. Women Veterans Reunion, November 9, 6:00-7:30pm at the Starlite Theatre, 3115 W. Hwy 76. The reception and dinner is free to all women veterans and a guest. Additional guests $10.00 each. You may pay at the door. Sponsors for this event include Veterans Holidays, Rankin Brothers Show, Starlite Theatre, Stone Hill Winery, Mount Pleasant Winery, Sam’s Club, Dixie Stampede, Moon River Grill, and the Branson Lakes Chamber of Commerce & CVB. Please RSVP for the dinner by emailing bvtf1@suddenlinkmail.com or calling 417.337.8387 by November 4. The Korean War Veterans Association Mini-Reunion, will once again be held at the Settle Inn (now the Stone Castle Hotel & Conference Center), 3050 Green Mountain Drive, in the Stonehenge Room. For more information, contact Joe Bryant, 417.365.1389. For more information on the complete list of activities during Veterans Week, visit www.bransonveterans.com. The Branson Veterans Task Force honors veterans every day of the year. For more information about this and other veteran-related events, contact the Branson Veterans Task Force at 1-417.337.8387 (417.337.VETS) or visit www.bransonveterans.com. Four members of the 1940s all-girl Sharon Rogers Band will attend Veterans Week activities in Branson, MO, to launch the story of their Pacific USO tour in the waning days of WWII and the early days of the Japanese occupation. 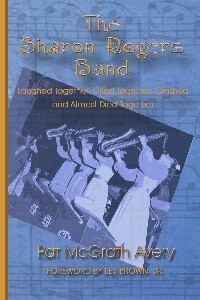 The book is titled The Sharon Rogers Band: Laughed Together, Cried Together, Crashed & Almost Died Together. At the request of the USO, the band agreed to join the USO. In the summer of 1945, they traveled first to Hawaii, and then to the Philippines, arriving in Manila as the war was ending. After touring throughout the Philippines, they traveled, at General MacArthur’s request, to Japan. They played throughout Japan. They attended General Yamashita’s war crimes trial, went to Hiroshima, visited military hospitals, served in mess halls, and played to more than 100,000 Allied troops. After their last performance in Korea, they headed back to Japan. Bad weather, low fuel and bombed-out airfields forced the pilot, Joe Zinno, to ditch the plane in the Sea of Japan. All aboard survived and were rescued by Japanese fishermen. Joe Zinno will join the band members in introducing their book. They will sign books at the WWII Reunion at the College of the Ozarks on November 6, and throughout the week at Veterans Village. Plan to capitalize on the opportunity to meet these charming ladies, hear their story and take home a signed copy of their book. The Branson Veterans Task Force will host the Opening Show and Closing Ceremony for Veterans Week. A fundraiser for the Branson Veterans Task Force, a VIP Luncheon with Lt. Col. Oliver North, is planned for November 11, 12 noon at the Chateau on the Lake. The week is packed with new activities and old favorites. Associated Artists of Branson will produce three of the Veterans Week activities beginning with the Opening Show at 2:00pm on Thursday, November 5 at the Mansion Theatre and ending with the Closing Show at 1:00pm on Wednesday, November 11 at the Starlite Theater. For the Vets, official opening kickoff for Branson Veterans Week activities. This 2-hour production show begins at 2:00pm at the Mansion Theatre. Admission is free. Tickets will be available the day of the show at the Mansion Box Office. Featured performers include The Oak Ridge Boys, Cathy Rigby, Hughes Brothers, Barbara Fairchild and Roy Morris, Premiere Dance Academy, The Chinese Acrobats and many more. This year’s production features several original dance numbers from a professional dance troupe provided by Midwest Dance Academy. Branson Mayor Raeanne Presley will welcome veterans and their guests to Branson. The Branson Stars & Flags Book Awards will be presented to authors of the award-winning books. Come early to assure the best seating. Doors open at 12:30 PM. Plan to have your picture taken before the show with a LIVE Bald Eagle in the lobby of the Mansion. VIP Luncheon with Lt. Col. Oliver North on November 11 at 12 noon at the Chateau on the Lake Resort. Reservations are limited to the first 100. The luncheon mixer is a fundraiser for the Branson Veterans Task Force. The $125 donation is tax-deductible. Attendees will personally meet Lt. Col. North, have a photo opportunity with him, and receive an autographed copy of his new book. Call 417-337-8387 or 417-699-6199 for reservations. Official Closing Ceremony at the Starlite Theater on Veterans Day, November 11 at 1:00pm. Celebrity appearances include Lt. Col. Oliver North, Moe Bandy, Clay Cooper, and Jim Barber. Mayor Raeanne Presley will speak. Admission is free but advance reservations are recommended. Call 417-337-9333. The College of the Ozarks Jazz Band will perform in the theater’s atrium lobby beginning at 12 noon. For more information on the complete list of activities, visit www.bransonveterans.com.